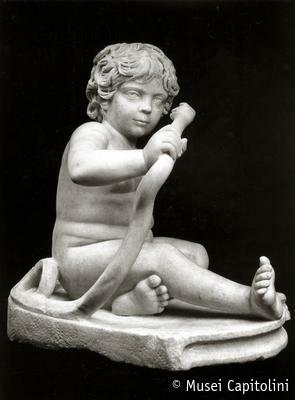 The statuette shows a child who, seated on the ground, is struggling with two snakes. The work is inspired by an episode from the life of the infant Hercules: enraged because of Zeus’s adultery with Alcmene, Hera had tried to kill baby Hercules, the offspring of Zeus’s infidelity, by sending two snakes into his cradle. The facial features, strongly characterized, suggest that the statuette may actually represent a real child, perhaps a young member of the imperial family who died at a very young age. The identification with Hercules could mean that the boy had been divinized soon after his death. The sculpture can be dated to the second half of the 2nd century AD, in the late Antonine period. Formerly in the collection of the cardinal Alessandro Albani, the statuette was purchased for the Capitoline Museum in 1733. Until 1816 it was displayed in the Sala del Fauno.